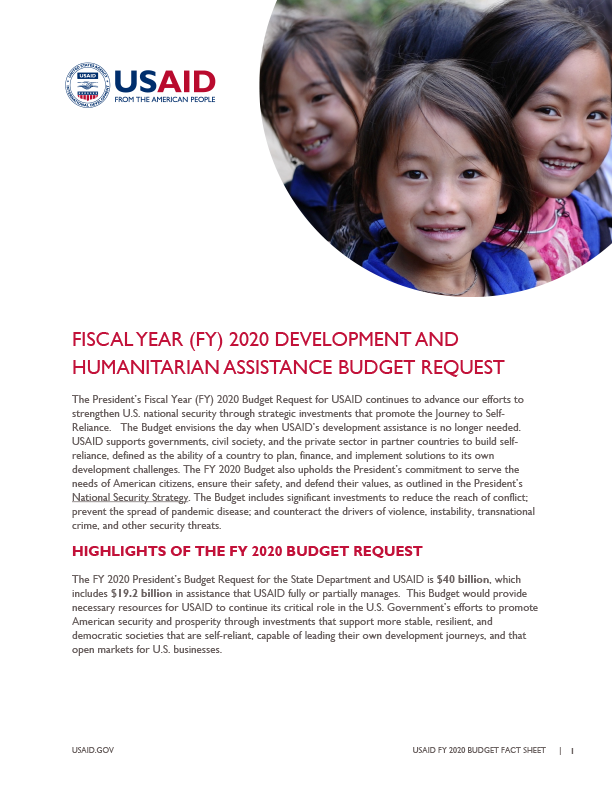 The President’s Fiscal Year (FY) 2020 Budget Request for USAID continues to advance our efforts to strengthen U.S. national security through strategic investments that promote the Journey to Self-Reliance. The Budget envisions the day when USAID’s development assistance is no longer needed. USAID supports governments, civil society, and the private sector in partner countries to build self-reliance, defined as the ability of a country to plan, finance, and implement solutions to its own development challenges. The FY 2020 Budget also upholds the President’s commitment to serve the needs of American citizens, ensure their safety, and defend their values, as outlined in the President’s National Security Strategy. The Budget includes significant investments to reduce the reach of conflict; prevent the spread of pandemic disease; and counteract the drivers of violence, instability, transnational crime, and other security threats. Protect U.S. Strategic Interests in the Indo-Pacific Region: The Budget would provide $1.8 billion in economic and security assistance for the State Department and USAID to promote a free, open, and secure Indo-Pacific region. The Administration’s Indo-Pacific Strategy represents a steadfast and enduring commitment to the region based on respect for sovereignty, rule of law, open markets, fair and reciprocal trading frameworks, transparency and good governance, freedom of navigation, and private-sector-led economic growth. U.S. support gives our allies and partners an independent voice. Advance Our Efforts to Win the Great Power Competition: The Budget would provide $661 million for the State Department and USAID to counter malign Russian influence in Europe, Eurasia, and Central Asia; advance bilateral relationships and enhance Western cohesion in the region; support citizen-responsive governance that promotes free and independent media; and combat corruption. Expand Opportunities to Promote Lasting Stability, Peace and Democracy: With the President’s Request, USAID would continue efforts to promote accountable, citizen-responsive, democratic governance and economic prosperity that advances peace and fosters resilience and stability. The Budget also would provide funding in support of U.S. border security by targeting illicit pathways used by criminal organizations to traffic humans, drugs, money, and weapons in the Western Hemisphere. 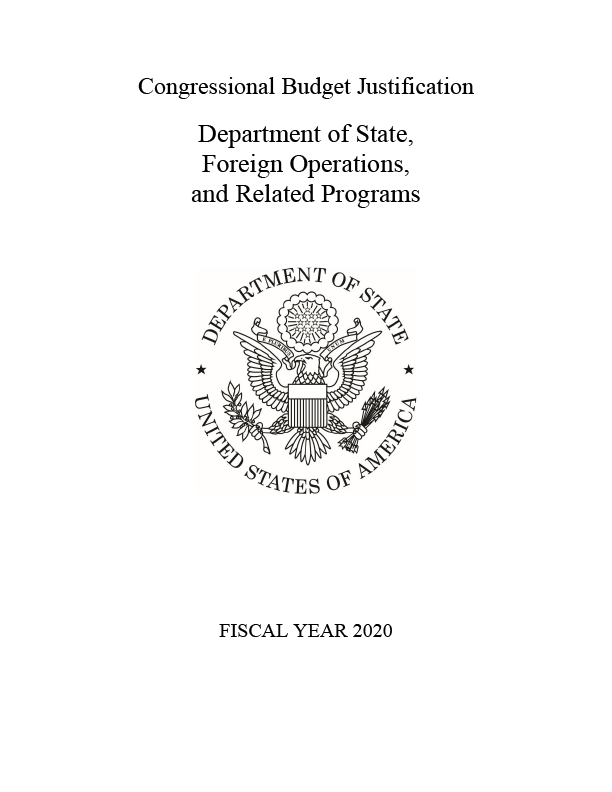 The Budget also would continue democracy assistance for Venezuela, and includes new flexibility to provide additional funds to support a democratic transition or respond to the crisis there, including up to $500 million in transfer authority to support programs managed by the State Department and USAID. Support and Protect Religious and Ethnic Minorities: The President’s Request would invest $150 million to support programs managed by the State Department and USAID to assist persecuted religious and ethnic minorities recovering from the devastation caused by the Islamic State in Iraq and Syria (ISIS), Al Qaeda, and other terrorist organizations in the Middle East and other regions. Mobilize Countries’ Own Domestic Resources: The President’s Request proposes to invest in financing self-reliance, which will improve countries’ abilities to marshal and manage their own development through domestic resource mobilization (DRM), fiscal transparency, private-sector engagement, public financial management, and the expansion of capital markets. Create New Opportunities for Private Sector Expansion: The Budget anticipates that State/USAID posts, Missions, and Regional Bureaus would use $50 million to buy into innovative financial tools in support of Administration priorities with the new Development Finance Corporation (DFC), building on the USAID Development Credit Authority today. This would serve to leverage the DFC’s development-finance tools and mobilize private-sector investment in support of U.S. foreign policy and development goals. Provide Quick Responses in Critical Transition Environments: The President’s Request includes $112 million to expand our ability to respond quickly and to stabilize emerging democracies. Catalyze Commerce and Trade: The Budget would provide $50 million for a new Presidential initiative, “Prosper Africa,” to increase trade and investment between U.S. and African partners to advance mutual prosperity. The Budget also promotes trade-facilitation, and supports economic reforms that combat corruption, promote transparency and accountability, and strengthen market-oriented governance and institutions. Expand Opportunities for Women to Reach Their Full Economic Potential: Includes $100 million for the Women’s Global Development and Prosperity (W-GDP) Fund to support U.S. Government-wide efforts that support training and skills development for women, expand access to finance for women entrepreneurs, and improve the enabling environment by reducing barriers to women’s free and full participation in the global economy. Leverage Strategic Partnerships with the Private Sector: Harness the assets, skills, and financial resources of the private sector to drive development. The President’s Request provides $70 million for Power Africa to facilitate private investment in power-generation and create new opportunities for economic partnerships. The Budget also includes $20 million for a New Partnerships Initiatives to expand our number of implementing partners to include more small communities and faith-based organizations. Provide Leadership in Response to Humanitarian Crises and Food Insecurity: The President’s Request of $6.3 billion for humanitarian assistance (including resettlement) would allow the United States to remain the largest single donor to crises around the world. Combined with carryover resources, the average program levels for 2019 and 2020 would maintain the highest annual U.S. humanitarian assistance programming ever. In addition to immediate humanitarian relief, the Budget would assist victims of conflict and natural disasters by addressing the underlying causes of food insecurity, including through $492 million for food security, of which $123 million would support resilience activities. Prioritize Global Public Health, and Prevent the Spread of Disease: The Budget would provide $6.3 billion in global health investments, which includes $4.3 billion for the President’s Emergency Plan for AIDS Relief (PEPFAR) and the Global Fund to fight AIDS, Tuberculosis, and Malaria, and $2.04 billion for USAID global health programs (GHP-USAID). USAID and State Department Global Health Programs contribute to global efforts to support three goals: Controlling the HIV/AIDS epidemic; preventing child and maternal deaths; and combating infectious diseases. USAID will continue to work across a variety of health priorities, including the President's Malaria Initiative, the Global Health Security Agenda, nutrition, tuberculosis, neglected tropical diseases, family planning, and women’s health. The Budget would fully fund the final year of the Administration’s PEPFAR Strategy, which would maintain all current patients on treatment and continue the United States’ position as the world’s top HIV/AIDS donor. With a new pledge for the Global Fund’s upcoming sixth replenishment, the United States would offer to match $1 for every $3 pledged by other donors, which should encourage others to increase their commitment and allow for a larger replenishment. Maximize the Impact of Every Dollar: The President’s Request would improve accountability and transparency through strengthening the design of foreign assistance programs, the increased use of innovative awards and co-creation with partners, rigorous monitoring and evaluation, improved response to program and financial audits, and the systematic application of lessons learned. Enhance Effectiveness Through USAID’s Transformation: The Budget aligns foreign assistance with the Administration’s policies and priorities; proposes a more flexible workforce; and fosters continual improvement, creativity, and accountability. Optimize Humanitarian Assistance Outcomes: The President’s Budget Request proposes to consolidate the implementation of all overseas humanitarian assistance at USAID and through a new, more flexible appropriations account, to respond most effectively and seamlessly to evolving humanitarian needs, achieve optimal reforms at the United Nations, induce other donors to do their fair share, and resolve ongoing crises. This restructuring builds on State’s and USAID’s comparative strengths, under new senior, dual-hatted State and USAID leadership structure under the authority of the Secretary of State.